"Shall We Save New York?" Advertisement, New York Times, March 5, 1916. With luxury department and specialty stores and garment lofts all migrating north, on or just off of Fifth Avenue, above 34th Street, conflict was inevitable. The store owners feared their customers would be scared away by the noontime congestion of male garment workers, just as they had been on the Ladies Mile. As a result, in 1916, the Fifth Avenue Association, an organization of property owners and retailers, threatened to boycott any manufacturer located in a "restricted zone" between Third and Seventh Avenues, and 33rd to 59th Streets. 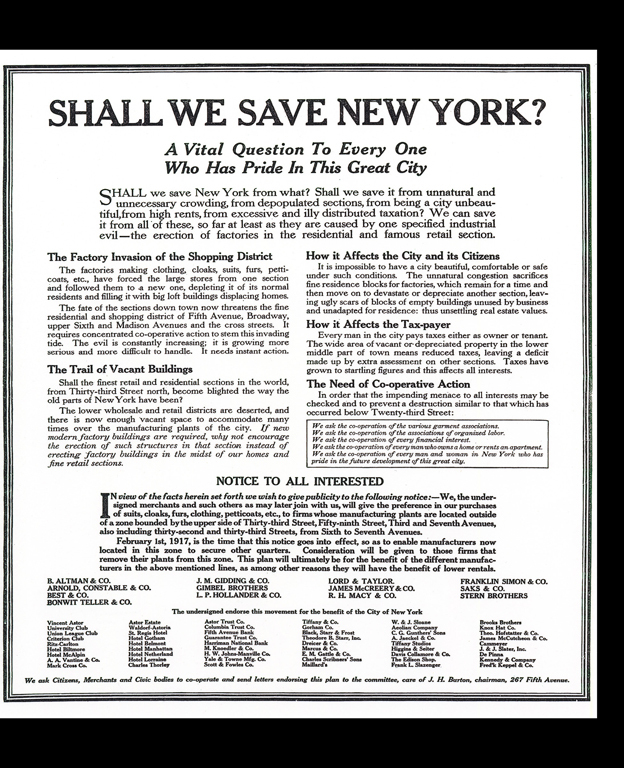 On March 5, 1916, New York newspapers published full-page advertisements paid for by the Fifth Avenue Association: "SHALL WE SAVE NEW YORK? : A Vital Question To Every One Who Has Pride In This Great City." The advertisement was signed by the major retail stores, as well as by banks, hotels, specialty stores, and prominent landowners. The manufacturers soon acquiesced to the committee's demands. In truth, few had much to lose by moving out of these new lofts where rents were high, and relocation would be easy, since sewing machines and other equipment were portable. But where to move? There was insufficient modern industrial space south of 33rd Street. Some broached moving the industry out of Manhattan. But garment manufacturers needed to be in the city, close to the department stores that purchased their wares, to the train terminals that brought buyers from across the country to their showrooms, and to transit lines used by workers on their daily commutes. Pressure to move out of the restricted zone mounted after World War I. Finally, in December 1919, the New York Times announced that "the establishment of a new center for the cloak and suit trade of New York has been definitely decided upon."